This week, we’ve got step-by-step instructions for making The Vegg Scramble, a new product that’s about to hit the market! I was excited to get my hands on an advance sample of The Vegg Scramble. I’ve used other products from The Vegg such as the Baking Mix and Vegan Egg Yolk and really wanted to see this new option that scrambles up like eggs. The instructions for The Vegg Scramble say to use Westsoy Unsweetened Soy Milk, but I always have the Plain flavor in my fridge so I used that instead. Unfortunately, I should have followed the recipe because the finished product had a slightly sweet flavor that was clearly from the sugar in the plain soy milk. Don’t make the same mistake I did – be sure to use an unsweetened soy milk! Heat a nonstick skillet on medium-high heat for 3 minutes. Meanwhile, add The Vegg Scramble powder to 3/4 cup unsweetened soy milk and whisk until well combined. My pan isn’t as stick-resistant as it once was, so I added a small amount of olive oil to make sure the mix didn’t stick. When the pan is hot, pour the mix in and immediately decrease the temperature to medium-low. Allow mix to heat in pan for 10 minutes. Gently move mix around in pan with a spatula to help cook off extra moisture. Continue cooking over medium-low heat for 5 minutes more until scramble is set. Slide scramble out of pan onto a plate. The manufacturer’s instructions say to microwave the scramble for a firmer texture, but I thought the texture was good and opted not to microwave it. 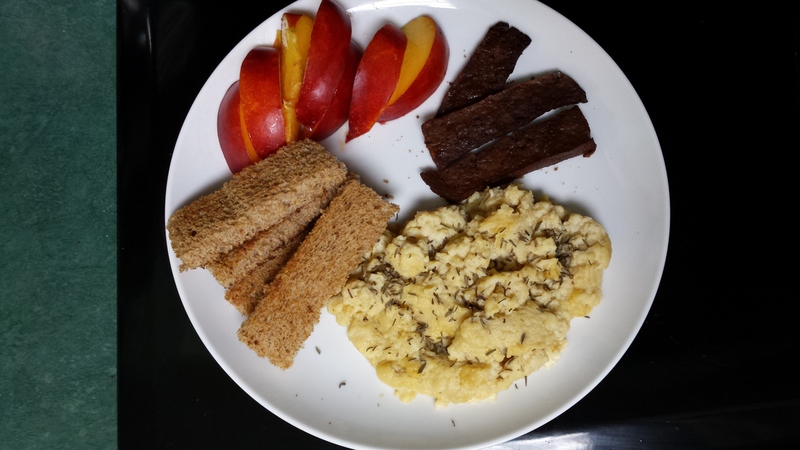 I served the scramble sprinkled with dried thyme, salt, and pepper along with toast, tofu-bacon, and sliced nectarine. Although I liked the texture, the scramble’s flavor wasn’t quite as “eggy” as some of the other products from The Vegg. While this might be a plus for some people, I was looking for a more pronounced flavor. The manufacturer actually recommends adding some of The Vegg Vegan Egg Yolk to the mix for a stronger egg flavor so I’ll try that next time. The Vegg Scramble is an innovative alternative to scrambled eggs that’s cholesterol-free, gluten-free, and cruelty-free. Online sales for this brand new product begin May 19 on The Vegg’s website. Vegan chef Elena Johnson is the president of Nourrie Cuisine, a company committed to fresh, wholesome, organic food that feeds the body and soul. Photographer Elizabeth Putsche is the executive director of Photographers for Animals. Elena and Elizabeth met nearly a decade ago through an animal protection organization and became fast friends. Together they create #MeatlessMonday recipe tutorials to encourage healthy and humane diet choices. Elena is a member of Photographers for Animals’ advisory board.